1-1/8" = 30mm wide Alligator, Lizard, or Smooth embossed leather. Supple italian calfskin lined with genuine leather for comfort. Sleek and professional quality solid antique silver plated buckle set. 5 Holes for Easy Fit Adjustment. Sizes Available from 32" thru 54". 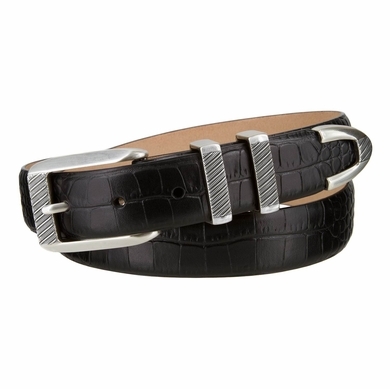 Comes in Alligator: black, brown, navy, gray, and tan; Lizard: black, brown, tan, and navy; Smooth: black and brown.